What’s your decorating style? If someone asked you that question, would you have an answer or be stuck for a reply, finally reaching for that catch-all word “eclectic?” There’s nothing wrong with having eclectic tastes. It just means that a diverse range of things appeals to you. But when you use the word “eclectic” to mean “I have absolutely no idea what I like,” the time has come to do a bit of detective work. Here are some ways to identify the colors and styles of home décor that will work best for you. Check your closet. One of the earliest questions of preference we’re ever asked is “What’s your favorite color?” It’s easy to answer “blue” or “green” or “purple,” but the real answer might be hanging in your closet, revealed by the colors that dominate your wardrobe. The colors you wear are the colors you like, the colors that provide you with a feeling of comfort and joy. So take notice if your wardrobe is characterized by sage greens or smoky purples or sophisticated grays—even if those aren’t the colors you respond to when asked the “favorite colors” question—because these just may be some of the colors that will work best for your home. Beyond colors, take a look at your use of patterns. Do you prefer bold prints or something subtler? Do you like fabrics that are smooth to the touch or those with a bit of texture? What about jewelry? Do you like classic or modern styles? The answers to these questions could help you determine how you’d like to decorate your home. Check out magazines and websites. Pick up popular decorating magazines—Architectural Digest, Better Homes & Gardens, House Beautiful, Elle Décor—and tag or cut out the photos that appeal to you. Then take a look at the collection of photos you’ve assembled. Are there common denominators in terms of colors, style, types of wood, trim, moldings, window coverings, floor preferences, and the like? Perhaps you’ll discover that you’re a big fan of decorative finishes or that you’re really into retro. And visit websites that offer color and design advice; there’s no shortage of interior designers and bloggers who offer insightful advice. Check out stores. Home décor stores often have beautiful displays showcasing how furniture, accessories, and flooring can work together. Visit such stores as Pottery Barn or Williams-Sonoma to see how their staff recommends accessorizing a table or dressing a bed. Visit a paint store or decorating center to peruse the paint color cards or to look at the room settings in the latest wallpaper books. Then decide which colors and patterns are the most appealing to you. Find affinity with an iconic designer. Some of the most iconic names in fashion have brought their flair to home décor. If you love the clothing of Ralph Lauren, then you might find yourself attracted to his home collection, with products ranging from furniture and fabrics to lighting and decorative accessories. Other designers who’ve stamped their sensibilities on home décor include Tory Burch, Kate Spade, Hermès, Alexander Julian, Chris Madden, and Candice Olson—just to name a handful. Consult an expert. 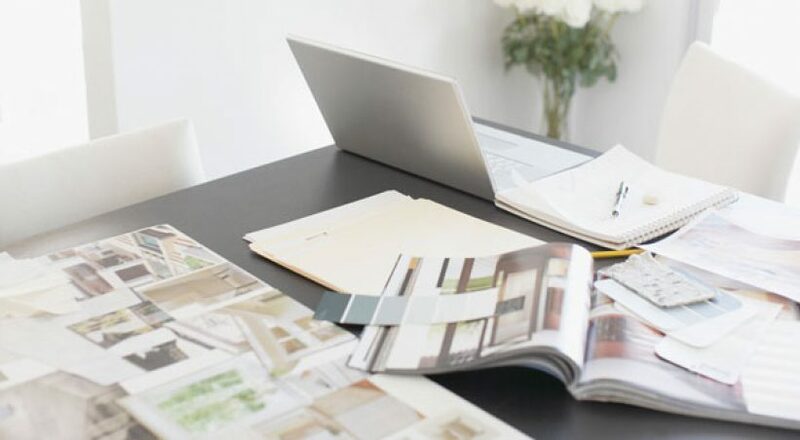 If you’re reluctant to make home decorating choices without a second opinion, then consult an interior decorator or designer with the education and expertise to guide you. Local paint and decorating stores offer color experts who can help you sort through thousands of paint chips and color cards to zero in on a color scheme.